Betty Wilson, one of the greatest women's cricketers who was sometimes called Australia's female Bradman, has died aged 88. Her decade-long international career lasted till 1958 and, in an era where there was little women's cricket, she averaged 57.46 with the bat and 11.80 bowling offspinners in 11 Tests. She made a spectacular entrance to top-flight cricket, scoring 90 and taking ten wickets on debut against New Zealand in 1948. In her next Test, she became the first Australian woman to make an Ashes hundred, and topped that effort with nine wickets in the match. Other highlights in a legendary career include becoming the first woman to take a Test hat-trick, becoming the first person to achieve the double of a century and ten wickets in a Test, and signing off with a couple of centuries and 21 wickets at 9.71 in her final series. 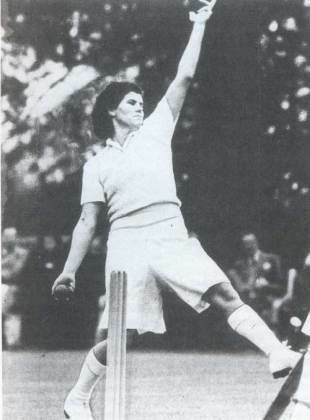 In 1985, Wilson became the first woman cricketer to be inducted into the Australian Sporting Hall of Fame and and that year the Under-21 National Women's Cricket Championship was renamed the Betty Wilson Shield. She was born in Melbourne in 1921 and became part of the club cricket scene by the age of 10, joining Collingwood. In four years, she had graduated to the second XI of the Victoria side and at 16 she was in the state side. A natural athlete, she was also admired for her work ethic - practicing daily when most of her team-mates trained once a week.